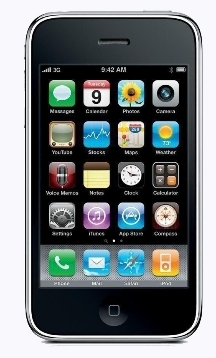 Apple iPhone 3G 8GB comes with TFT capacitive touchscreen, 320 x 480 pixels, 3.5 inches, iPhone OS which is upgradable to iOS 4.2.1 with 412 MHz ARM 11 processor. The phone also has the features like Scratch-resistant glass, oleo phobic coating with 2 megapixel camera. Apple iPhone 3G has the internal 8 GB memory. The phone comes with the standard Li-Ion battery.